Second-generation dark matter detector prepares to continue the search for WIMPs. Five years ago, lead scientists for the Large Underground Xenon (LUX) experiment presented the first scientific results to come from the 4850 Level of Sanford Lab since Ray Davis’ Nobel-winning research in the 1960s. And the results were big. After a run of just over three months operating a mile underground, LUX had proven itself the most sensitive dark matter detector in the world. “LUX is blazing the path to illuminate the nature of dark matter,” said Brown University physicist Rick Gaitskell, co-spokesperson for LUX with physicist Dan McKinsey of Yale University, at the time. Dark matter, so far observed only by its gravitational effects on galaxies and clusters of galaxies, is the predominant form of matter in the universe—making up more than 80 percent of all matter. Weakly interacting massive particles, or WIMPs—so-called because they rarely interact with ordinary matter except through gravity—are the leading theoretical candidates for dark matter. The mass of WIMPs is unknown, but theories and results from other experiments suggest a number of possibilities. This month, we celebrate five years of LUX, and look into the steps being taken toward the much larger and far more sensitive experiment. The following are just a few of the steps being taken by the LZ collaboration to make an experiment 30 times bigger and 100 times more sensitive—all in the pursuit of WIMPs. To make room for this scaled-up experiment, renovations had to occur inside the Davis Cavern. The Davis Cavern renovation project included removing an existing cleanroom, tearing down a wall between two former low-background counting rooms, installing a new hoist system, building a work deck and preparing the water tank itself to accommodate the larger cryostat. In addition to hosting the experiment nearly a mile underground to escape cosmic radiation, additional protections had to be put in place, including a radon-reduction system that was installed to further ensure the experiment remains free of backgrounds that could interfere with the results. Radon, a naturally occurring radioactive gas, significantly increases background noise in sensitive physics projects. The radon reduction system pressurizes, dehumidifies and cools air to minus 60 degrees Celsius before sending it through two columns, each filled with 1600 kg of activated charcoal, which remove the radon. The pressure is released, warmed and humidified before flowing into the cleanroom. The arrival of the LZ cryostats at Sanford Lab in May 2018 marked a significant milestone in the LZ project, as the cryostat was several years in the making and is a key component in the experiment. The cryostat works in a similar way to a big thermos flask and keeps the detector at freezing temperatures. 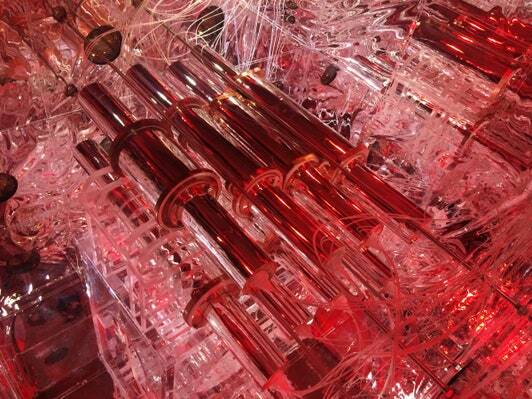 This is crucial because the detector uses xenon, which at room temperature is a gas. For the experiment to work, the xenon must be kept in a liquid state, which is only achievable at about minus 148 degrees Fahrenheit. 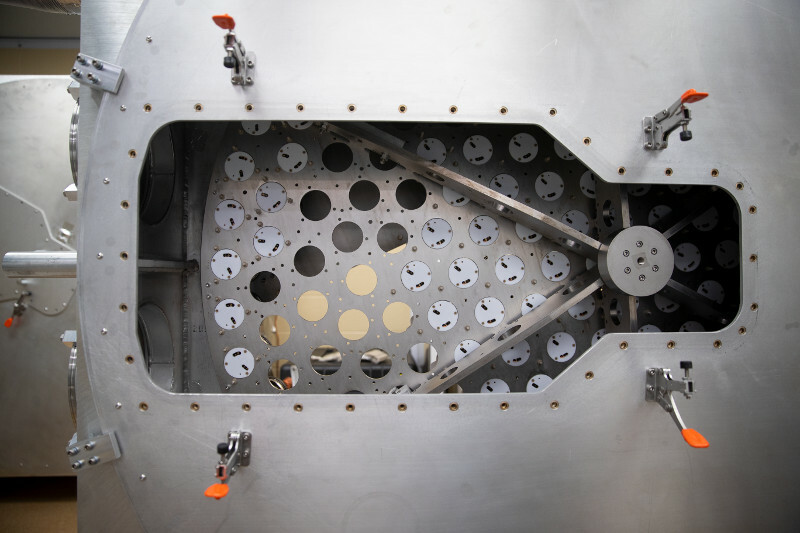 After being delivered to the surface facility at Sanford Lab, the outer cryostat vessel of the cryostat chamber spent five weeks being fully assembled and leak-checked in the Assembly Lab clean room. It has now been disassembled and packaged for transportation from the surface to the underground location on the 4850 Level. The inner cryostat vessel also passed its leak test. To ensure unwanted particles are not misread as dark matter signals, LZ’s liquid xenon chamber will be surrounded by another liquid-filled tank and a separate array of photomultiplier tubes that can measure other particles and largely veto false signals. “The LUX water tank needed a number of ports added or modified to support the LZ infrastructure. We also added the capability to install small hoisting equipment on the ceiling of the tank,” said Simon Fiorucci, a physicist with Lawrence Berkeley National Laboratory, who oversaw LUX operations at Sanford Lab and will serve in a similar role for LZ. Once these steps were completed, the entire inside of the tank had to be re-passivated to prevent rusting during its many years of service ahead. Finally, the tank was filled to the brim and monitored for a week to ensure there were no leaks. Additionally, LZ will include a component not present in LUX—nine acrylic tanks, filled with a liquid scintillator, will form a veto system around the experiment, allowing researchers to better recognize a WIMP if they see one. The acrylic tanks, or more precisely the liquid scintillator inside the tanks, are crucial in bringing the experiment to a new level of sensitivity—100 times greater than LUX—by identifying neutrons, which can mimic dark matter signals. These are just a few of the many steps being taken to ensure that LZ once again scours the universe with pristine accuracy. 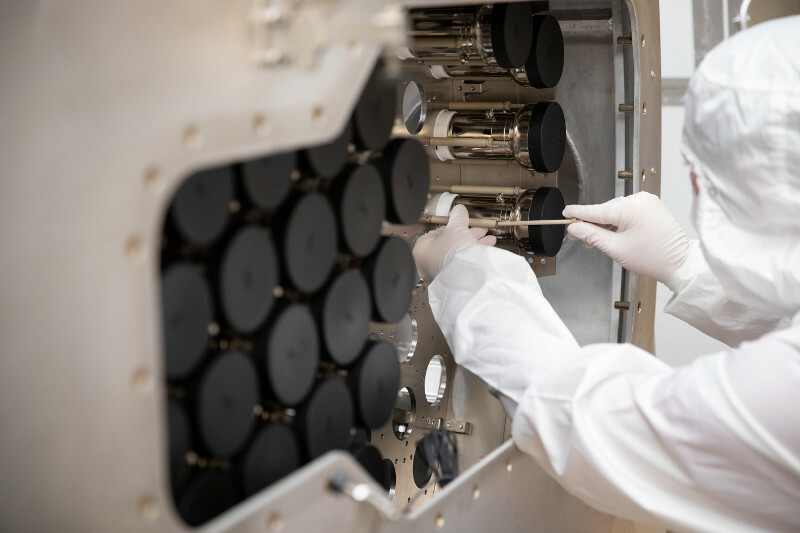 “We want to do again what we did five years ago—create the most sensitive dark matter detector in the world,” said Dr. Markus Horn, research scientist at Sanford Lab and a member of the LZ collaboration. Figuring out how to extend the search for dark matter particles – dark matter describes the stuff that makes up an estimated 85 percent of the total mass of the universe yet so far has only been measured by its gravitational effects – is a bit like building a better mousetrap…that is, a mousetrap for a mouse you’ve never seen, will never see directly, may be joined by an odd assortment of other mice, or may not be a mouse after all. Now, through a new research program supported by the U.S. Department of Energy’s Office of High Energy Physics (HEP), a consortium of researchers from the DOE’s Lawrence Berkeley National Laboratory (Berkeley Lab), UC Berkeley, and the University of Massachusetts Amherst will develop sensors that enlist the seemingly weird properties of quantum physics to probe for dark matter particles in new ways, with increased sensitivity, and in uncharted regions. Maurice Garcia-Sciveres, a Berkeley Lab physicist, is leading this Quantum Sensors HEP-Quantum Information Science (QIS) Consortium. Quantum technologies are emerging as promising alternatives to the more conventional “mousetraps” that researchers have previously used to track down elusive particles. 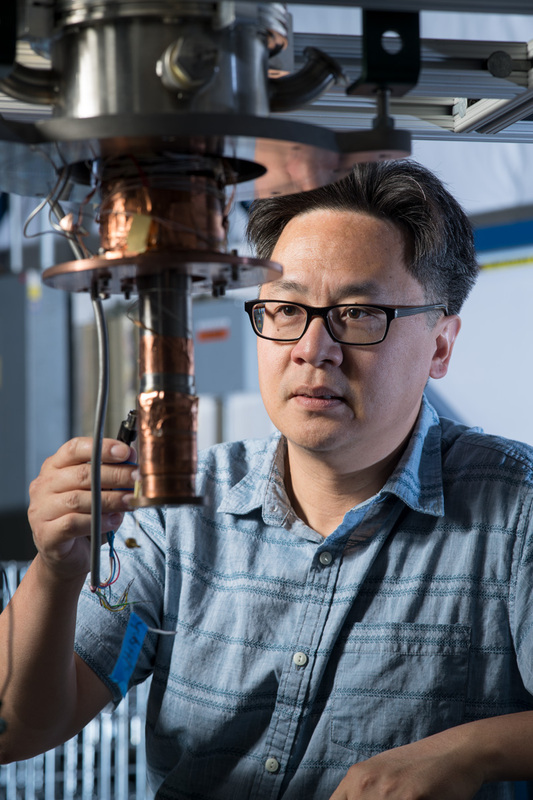 And the DOE, through the same HEP office, is also supporting a collection of other research efforts led by Berkeley Lab scientists that tap into quantum theory, properties, and technologies in the QIS field. Unraveling the Quantum Structure of Quantum Chromodynamics in Parton Shower Monte Carlo Generators – This effort will develop computer programs that test the interactions between fundamental particles in extreme detail. Current computer simulations are limited by classical algorithms, though quantum algorithms could more accurately model these interactions and could provide a better way to compare with and understand particle events measured at CERN’s Large Hadron Collider, the world’s most powerful particle collider. Berkeley Lab’s Christian Bauer, a senior research scientist, will lead this effort. Quantum Pattern Recognition (QPR) for High-Energy Physics –Increasingly powerful particle accelerators require vastly faster computer algorithms to monitor and sort through billions of particle events per second, and this effort will develop and study the potential of quantum-based algorithms for pattern recognition to reconstruct charged particles. Such algorithms have the potential for significant speed improvements and increased precision. Led by Berkeley Lab physicist and Divisional Fellow Heather Gray, this effort will involve high-energy physics and high-performance computing expertise in Berkeley Lab’s Physics Division and at the Lab’s National Energy Research Scientific Computing Center, a DOE Office of Science User Facility, and also at UC Berkeley. Skipper-CCD, a New Single-Photon Sensor for Quantum Imaging – For the past six years, Berkeley Lab and Fermi National Accelerator Laboratory (Fermilab) have been collaborating in the development of a detector for astrophysics experiments that can detect the smallest individual unit of light, known as a photon. This Skipper-CCD detector was successfully demonstrated in the summer of 2017 with an incredibly low noise that allowed the detection of even individual electrons. As a next step, this Fermilab-led effort will seek to image pairs of photons that exist in a state of quantum entanglement, meaning their properties are inherently related – even over long distances – such that the measurement of one of the particles necessarily defines the properties of the other. Steve Holland, a senior scientist and engineer at Berkeley Lab who is a pioneer in the development of high-performance silicon detectors for a range of uses, is leading Berkeley Lab’s participation in this project. Geometry and Flow of Quantum Information: From Quantum Gravity to Quantum Technology –This effort will develop quantum algorithms and simulations for properties, including error correction and information scrambling, that are relevant to black hole theories and to quantum computing involving highly connected arrays of superconducting qubits – the basic units of a quantum computer. 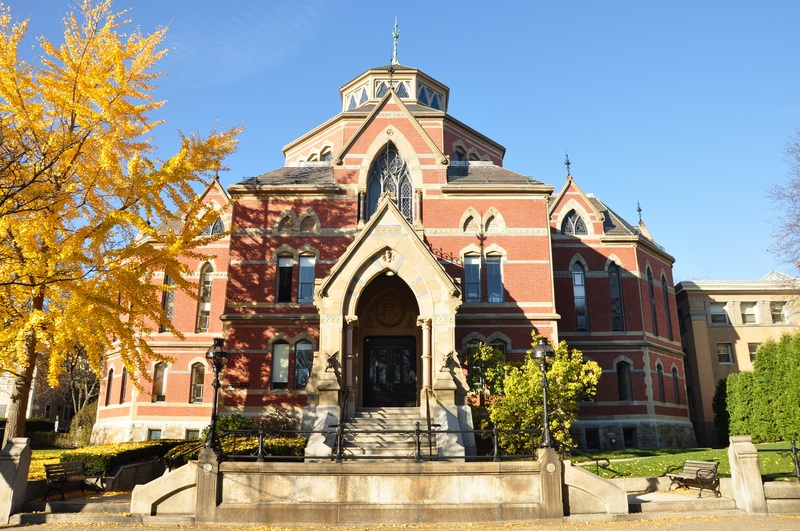 Researchers will also compare these with more classical methods. UC Berkeley is heading up this research program, and Irfan Siddiqi, a scientist in Berkeley Lab’s Materials Sciences Division and founding director of the Center for Quantum Coherent Science at UC Berkeley, is leading Berkeley Lab’s involvement. These projects are also part of Berkeley Quantum, a partnership that harnesses the expertise and facilities of Berkeley Lab and UC Berkeley to advance U.S. quantum capabilities by conducting basic research, fabricating and testing quantum-based devices and technologies, and educating the next generation of researchers. Also, across several of its offices, the DOE has announced support for a wave of other R&D efforts (see a related news release) that will foster collaborative innovation in quantum information science at Berkeley Lab, at other national labs, and at partner institutions. At Berkeley Lab, the largest HEP-funded QIS-related undertaking will include a multidisciplinary team in the development and demonstration of quantum sensors to look for very-low-mass dark matter particles – so-called “light dark matter” – by instrumenting two different detectors. One of these detectors will use liquid helium at a very low temperature where otherwise familiar phenomena such as heat and thermal conductivity display quantum behavior. The other detector will use specially fabricated crystals of gallium arsenide (see a related article), also chilled to cryogenic temperatures. The ideas for how these experiments can search for very light dark matter sprang from theory work at Berkeley Lab. Garcia-Sciveres, who is leading the effort in applying quantum sensors to the low-mass dark matter search, noted that other major efforts – such as the Berkeley Lab-led LUX-ZEPLIN (LZ) experiment that is taking shape in South Dakota – will help root out whether dark matter particles known as WIMPs (weakly interacting massive particles) exist with masses comparable to that of atoms. But LZ and similar experiments are not designed to detect dark matter particles of much lower masses. Researchers hope to develop quantum sensors that are better at filtering out the noise of unwanted signals. 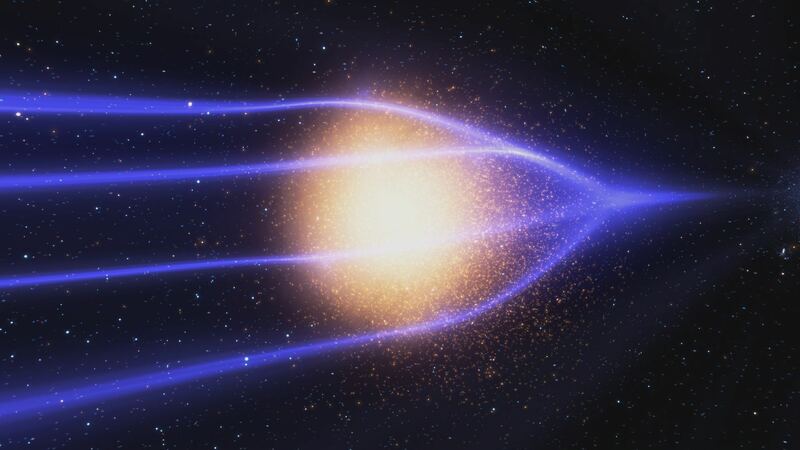 While a traditional WIMP experiment is designed to sense the recoil of an entire atomic nucleus after it is “kicked” by a dark matter particle, very-low-mass dark matter particles will bounce right off nuclei without affecting them, like a flea bouncing off an elephant. The goal of the new effort is to sense the low-mass particles via their energy transfer in the form of very feeble quantum vibrations, which go by names like “phonons” or “rotons,” for example, Garcia-Sciveres said. “You would never be able to tell that an invisible flea hits an elephant by watching the elephant. But what if every time an invisible flea hits an elephant at one end of the herd, a visible flea is flung away from an elephant at the other end of the herd?” he said. The demonstration detectors will each have about 1 cubic centimeter of detector material. 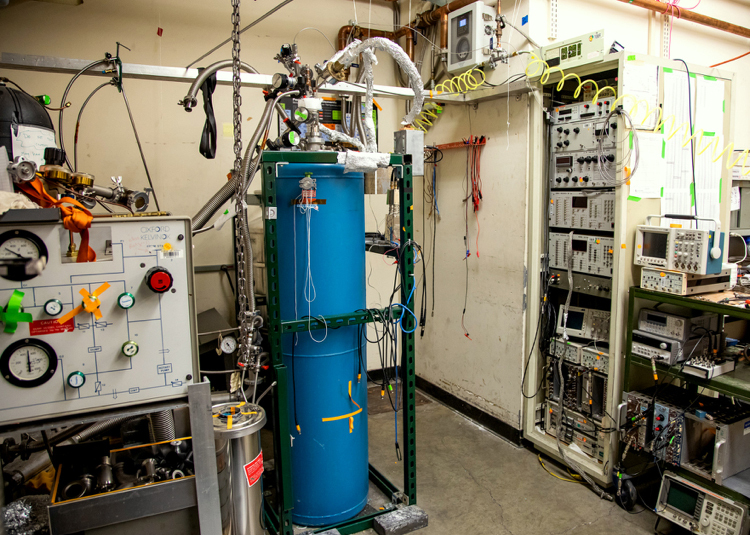 Dan McKinsey, a Berkeley Lab faculty senior scientist and UC Berkeley physics professor who is responsible for the development of the liquid helium detector, said that the detectors will be constructed on the UC Berkeley campus. Both are designed to be sensitive to particles with a mass lighter than protons – the positively charged particles that reside in atomic nuclei. The superfluid helium detector will make use of a process called “quantum evaporation,” in which rotons and phonons cause individual helium atoms to be evaporated from the surface of superfluid helium. There are many synergies in the expertise and capabilities that have developed both at Berkeley Lab and on the UC Berkeley campus that make it a good time – and the right place – to develop and apply quantum technologies to the hunt for dark matter, Zurek said. Theories developed at Berkeley Lab suggest that certain exotic materials exhibit quantum states or “modes” that low-mass dark matter particles can couple with, which would make the particles detectable – like the “visible flea” referenced above. The new project will draw from a deep experience in building other types of particle detectors, and R&D in ultrasensitive sensors that operate at the threshold where an electrically conducting material becomes a superconductor – the “tipping point” that is sensitive to the slightest fluctuations. Versions of these sensors are already used to search for slight temperature variations in the relic microwave light that spans the universe. At the end of the three-year demonstration, researchers could perhaps turn their sights to more exotic types of detector materials in larger volumes. “I’m excited to see this program move forward, and I think it will become a significant research direction in the Physics Division at Berkeley Lab,” she said, adding that the program could also demonstrate ultrasensitive detectors that have applications in other fields of science. At an annual physics meeting in the Alps, WIMPs appeared to lose their foothold as the favored dark matter candidate, making room for a slew of new ideas. The Rencontres de Moriond (Moriond Conferences) have been a fixture of European high-energy physics for over half a century. These meetings—typically held at an Alpine ski resort—have been the site of many big announcements, such as the first public talk on the top quark discovery in 1995 and important Higgs updates in 2013. One day, perhaps, a dark matter detection will headline at Moriond. For now, physicists wait. But they’ve gotten a bit anxious, as their shoo-in candidate, the WIMP, has yet to make an appearance—despite several ongoing searches. At this year’s Moriond, held this past March in La Thuile, Italy, some of the limelight passed to other dark matter candidates, such as axions, black holes, superfluids, and more. WIMPs, or weakly interacting massive particles, have been a popular topic over the years at Moriond, according to meeting organizer Jacques Dumarchez from the Laboratory of Nuclear Physics and High Energy (LPNHE) in France. The reason for this enthusiasm is that WIMPs fall out of theory without much tweaking. Extensions of the standard model, like supersymmetry, predict a host of particles with weak interactions and a mass in the 1 to 100GeV∕c2 range. If WIMPs like this were created in the big bang, then, according to simple thermodynamic arguments, their density would match the expectations for dark matter based on astronomical observations. This seemingly effortless matching has been called the WIMP miracle. But these days, the miracle has less of a halo around it. At this year’s Moriond, updates from direct and indirect searches for WIMPs sounded almost apologetic. 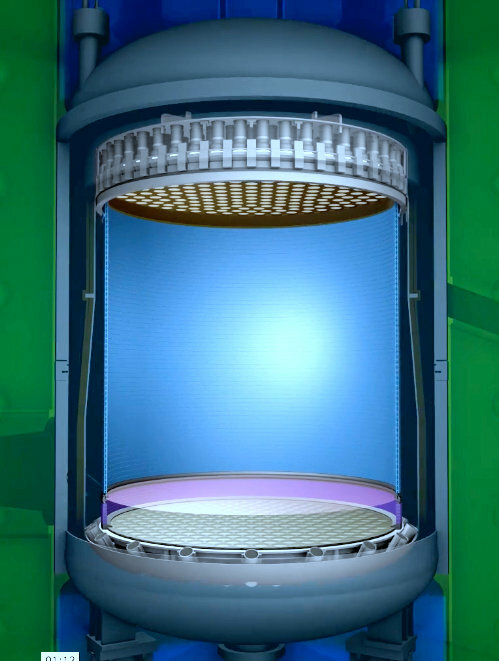 Alessandro Manfredini of the Weizmann Institute of Science in Israel told his listeners to “keep calm… and fingers crossed,” as he gave the latest news from Xenon 1T, a one-ton dark matter detector at Italy’s Gran Sasso laboratory. 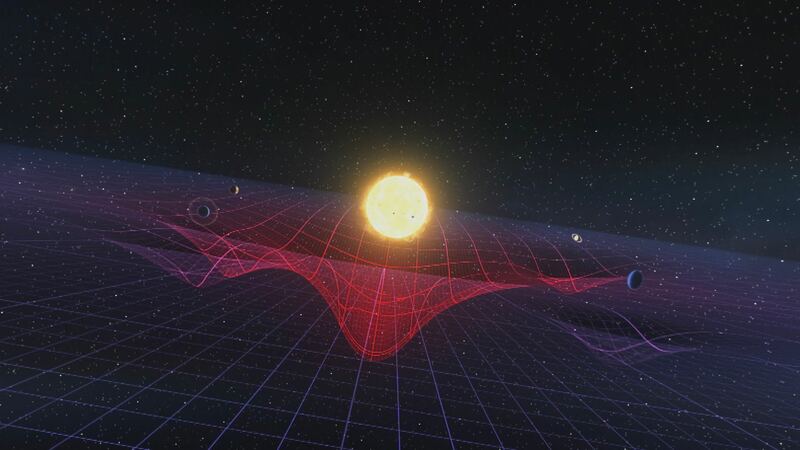 He showed that the experiment has now reached record-breaking sensitivity, so that if a 50GeV∕c2 WIMP exists, the next data release could reveal ten events. But, like other WIMP searches, the current results rule the particles out—by putting tighter limits on their properties—rather than rule them in. The hunt will continue for years to come, but the WIMP paradigm has “started to look less as the obvious solution to the dark matter problem,” Dumarchez said. When did WIMP confidence start to deflate? Tim Tait from the University of California, Irvine, described the change as gradual. “It is hard to say exactly when it began, but I think it was becoming noticeable around 2014 or so,” Tait said. That’s when the null results from dark matter searches began closing the favored parameter space for the WIMP model. “Of course, there is still a good opportunity for those searches to discover WIMPs,” he said. 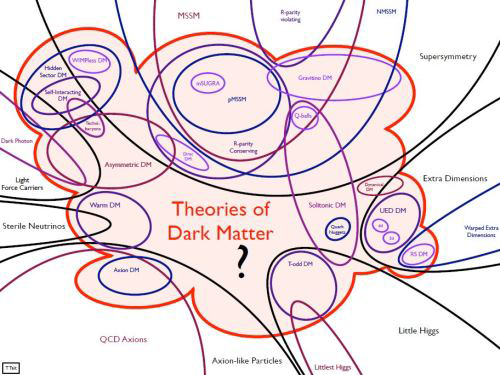 At Moriond, Tait gave an overview of dark matter candidates, in which he discussed WIMPs but devoted much of his time to the dazzling variety of other dark matter theories. Chief among these is the axion. Like the WIMP, it is well-motivated from particle physics theory, as it may explain why strong interactions do not violate CP symmetry, while weak interactions do. The axion is also the target of several dedicated searches, such as ADMX. Other familiar “dark horse” candidates discussed at Moriond were neutrinos and black holes—with the latter seeing a boost in popularity after recent gravitational-wave observations. But at the conference, the doors seemed open to all comers, with several new dark matter ideas taking the stage. One of the talks was by Justin Khoury from the University of Pennsylvania in Philadelphia, who advocates a superfluid model of dark matter. The main assumption here is that dark matter has strong self-interactions that cause it to cool and condense in the centers of galaxies. The resulting superfluid could help explain certain anomalies in observed galactic velocity profiles. Martin Sloth from the University of Southern Denmark takes a very different approach. Rather than having strong interactions, his so-called Planckian interacting dark matter has zero interactions beyond gravity, but it makes up for its lack of interactions with an enormous mass (around 1028eV∕c2). 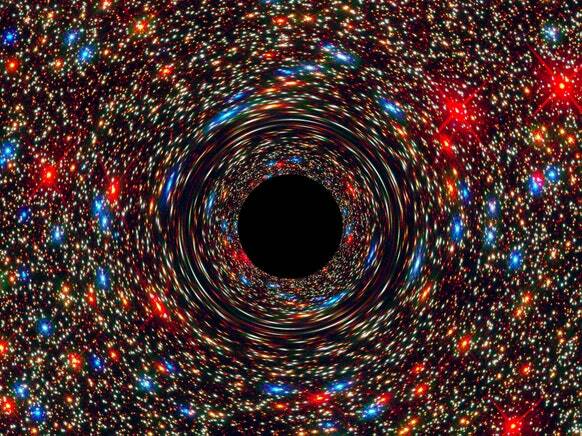 At the opposite end of the mass spectrum is fuzzy dark matter, weighing in at 10−22eV∕c2. These ethereal particles could explain an apparent lack of small galaxies. But they could also run into constraints from observed absorption in the intergalactic medium, explained Eric Armengaud from France’s Atomic Energy Commission (CEA) in Saclay. Thanks for reading and commenting. It is much appreciated. Dark matter is a supersolid that fills ’empty’ space and is displaced by visible matter. What is referred to geometrically as curved spacetime physically exists in nature as the state of displacement of the dark matter. 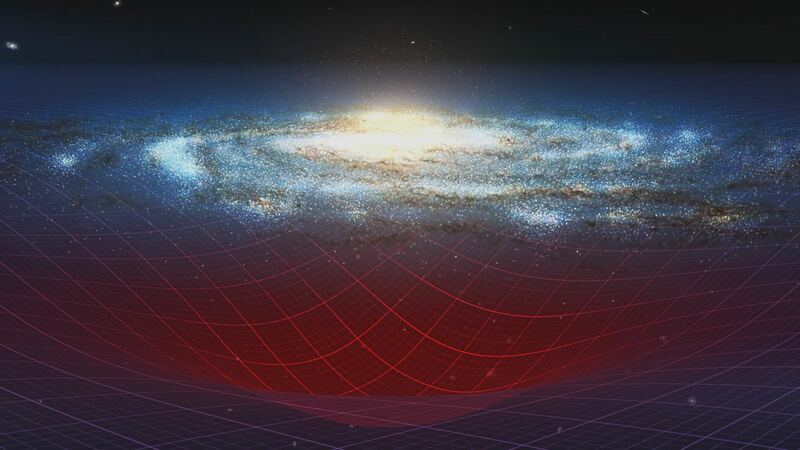 The state of displacement of the dark matter is gravity.